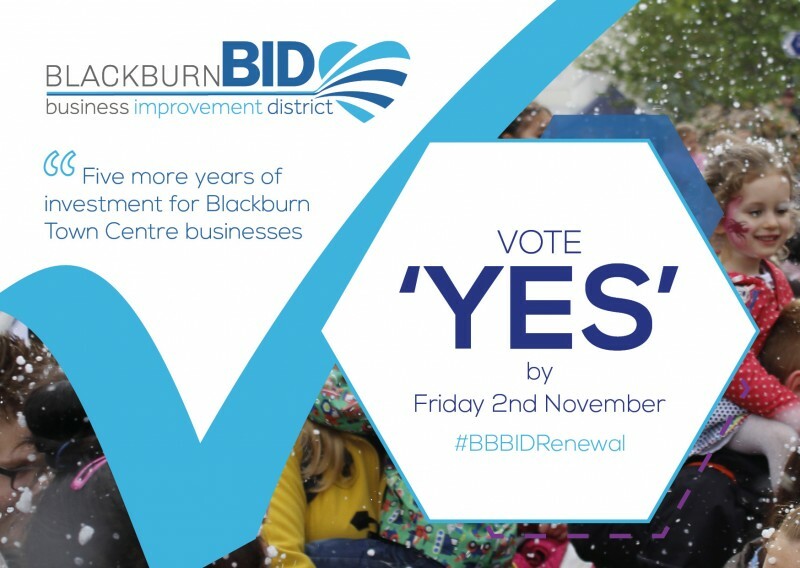 Businesses in Blackburn Town Centre are being reminded that ballot papers for the renewal vote for Blackburn Business Improvement District must be returned by Friday 2nd November. With just one week ago, the 355 businesses in the designated town centre BID area, are being urged to complete their voting papers and give the BID a strong “YES” vote for 5 more years of investment. The BID’s current term ends on 31st December 2018. Blackburn has become well-known for the events organised and promoted by the Blackburn BID. Hundreds of thousands of visitors have enjoyed these landmark events and campaigns, along with other BID supported festivals such as the Festival of Making and the Blackburn Cathedral Flower Festival. In 2018 visitors have already enjoyed a Vintage Carnival and still to come a full Christmas programme, including a full-scale Christmas Market. All this will end if the BID does not secure a “YES” vote. Blackburn has received numerous awards since we began working together as Blackburn BID. They include the “Winner of Winners” Great British High Street Award, The Great British High Street Town Centre of the Year, Lancashire Tourism Award Finalists, Britain in Bloom Regional and National Gold Medalsa and Blackburn with Darwen Hive Awards. All BID town centre events will end. This includes family focused festivals and additional support for other events. The contribution of the BID has brought events such as Countryside Comes to Town, Blackburn Vintage Carnival, Street Fairs and the Christmas programme of events alive in the last five years in Blackburn. All BID marketing and promotions will end. This includes the positive PR that has been generated for the town (Estimated to be worth over £2m). Initiatives such as the Blackburn Magazine which went to 20,000 homes across the county and sponsorship of other events such as the Blackburn Cathedral Flower Festival and the National Festival of Making. All BID funding for additional PCSO’s and additional town centre security will end. All BID planting schemes will end. Planting schemes in Blackburn have achieved the town three Britain in Bloom awards. All BID support for Blackburn Business Against Crime will end. All BID funding for infrastructure such as CCTV and signage will end. All BID supported safety initiatives will end. All BID schemes to encourage visitors from a wide area will end. The BID has organised high profile events such as Countryside Comes to Town, Blackburn Heritage Festival, The Fire Garden, Here Be Dragons, The Big Easter Egg Hunt, Street Fairs, Steam Sunday and packed Christmas programmes. Our partnerships with The Mall, Blackburn Market, Blackburn with Darwen Borough Council and Blackburn Cathedral has ensured that a calendar of events has been strategically planned throughout the five-year period to continually support Blackburn’s positive identity. We have also supported and promoted other high-profile events such as the Blackburn Cathedral Flower Festival & the National Festival of Making. 2018: The recent Blackburn Vintage Carnival in September and a strong Christmas programme including favourites such as the Festival of Light & Lights Switch On, joined this year by a full-scale month-long Christmas Market on Cathedral Square. A negative perception of safety can deter some people from visiting the area and new businesses from locating to the town. Anti-social behaviour, shoplifting and environmental crime are social issues that have been identified by current businesses. The increased presence of community officers has provided businesses, consumers and visitors with the confidence that these issues are being tackled. In the wider BID area, private security staff continue to be deployed to support the Townsmoor Retail Park during busy seasons. Through partnership with BBAC (Blackburn Businesses Against Crime) key events within the town centre have benefited from extra policing and security patrols. Blackburn’s BID area has seen an improvement in cleanliness and appearance through planting projects, new litter bins and the enhancement of visitor signage. By working with resident businesses to identify target areas of concern across the town centre, it has been possible to tackle those zones which may not promote Blackburn’s positive image. The BID area continues to become an attractive location that entices new businesses, shoppers and visitors. Through continued consultation with local businesses, the BID has responded to the need to attract new businesses to the town. Communication with existing businesses has enabled the BID to adapt to the priorities and requirements of Blackburn’s traders. From the close monitoring of visitor footfall to the continued promotion of the BID & other events, Blackburn continues to attract national interest. Business property vacancy rates in the BID area have fallen from 21% in 2013 to 14.6% at Q1 of 2018. The message from Blackburn BID is clear. Vote “YES” to ensure we can continue our vital work for Blackburn Town Centre. Businesses have until the 2nd November 2018 to return their ballot papers and the result will be announced in early November. The Blackburn BID comes to the end of its first five-year term at the end of 2018 and voting papers for a new term to run from 2019. The Blackburn BID, which is funded directly by town centre businesses, has delivered a diverse range of projects for the town over the last five years from award winning events to improvements to the safety and security of the town centre.